BEAUTIFUL HOUSE IN DESIRABLE COLONIAL ACRES WITH GOOD DEEP WATER AT YOUR BACKYARD...KEEP YOUR BOAT AT YOUR OWN DOCK AND HAVE EASY ACCESS TO THE SALT PONDS MARINA AND THE CHESAPEAKE BAY! UPGRADED AND UPDATED THROUGHOUT! BRAZILIAN KOA FLOORS, KITCHEN WITH BEAUTIFUL GRANITE, UPGRADED CABINETRY & GORGEOUS TILE AND STONE BACKSPLASH, STEP-DOWN DEN WITH FIREPLACE, HUGE LAUNDRY ROOM, AND UPDATED BATHROOMS. NICE SIZED ROOM ON 1ST FLOOR WITH ADDITIONAL OFFICE AREA THAT COULD BE A 1ST FLOOR BEDROOM, HUGE MASTER SUITE WITH PRIVATE BALCONY WITH COMPOSITE DECKING AND RAILING, AND LARGE WALK-IN CLOSET, AND 2ND BEDROOM HAS CLOSET THE LENGTH OF THE BEDROOM. 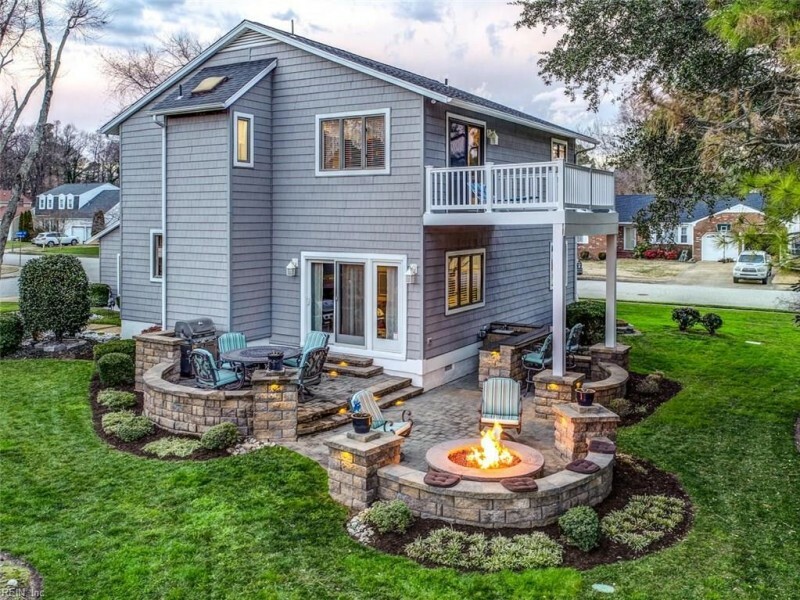 AMAZING BACKYARD FEATURES AN OUTDOOR KITCHEN WITH GRANITE COUNTER, EXTENSIVE STONE WORK LANDSCAPING, BUILT-IN FIREPIT, BEAUTIFUL CUSTOM LIGHTING, AND DID I MENTION YOU CAN KEEP YOUR BOAT RIGHT AT YOUR BACKYARD! GARAGE HAS MINI-SPLIT SYSTEM WITH HEAT AND AIR YEAR-ROUND, HOUSE HAS 22 KW GENERATOR, AND COMPOSITE CEDAR SHAKE SIDING. Ready to visit 22 Coach? Request a free property tour! Send me more information about the listing at 22 Coach, Hampton, VA 23664, MLS# 10239981. This 3 bedroom, 3 bathroom home located at 22 Coach, Hampton, VA 23664 has approximately 2,454 square feet. It is currently listed for $390,000 and has a price per sqft of $15,892. This home is currently Under Contract under the MLS#: 10239981. This listing is provided by Abbitt Realty Company LLC. 22 Coach Street, Hampton was built in 1983. It has Garage Att 2 Car, Off Street, Driveway Spc, Street parking.The kitchen includes 220 V Elec, Dishwasher, Dryer Hookup, Microwave, Gas Range, Washer Hookup. 22 Coach is part of the Colonial Acres - 021 neighborhood located in 23664.